This unit at the Villas is a charming, authentically built palapa, surrounded by beautiful desert landscape. 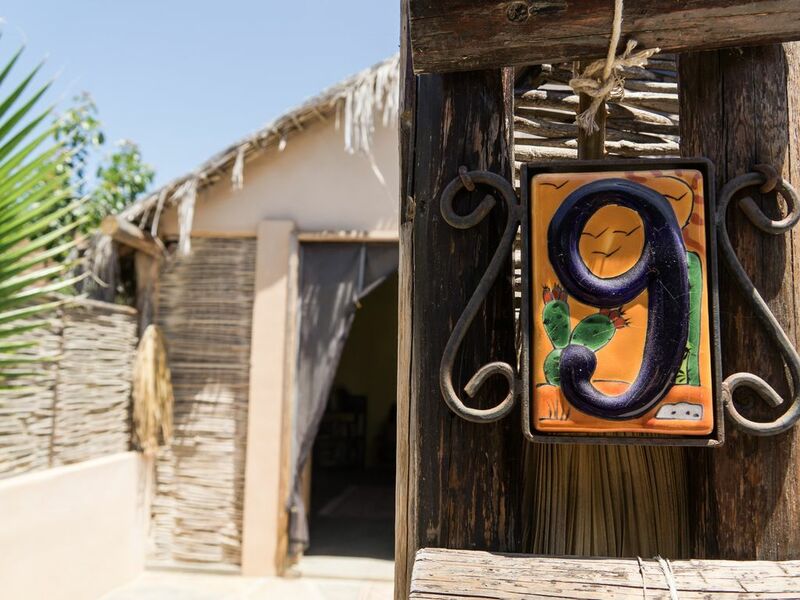 It is built in the traditional Mexican style with palo de arco and adobe walls. Inside the palapa is an open floor plan with separate space with queen sized bed. There is a double futon in the living space, a dining area, private bathroom and 2 ceiling fans which keep the palapa cool. The kitchen is located outside with additional living and dining space to enjoy the cool mornings and warm evenings of Baja. The outdoor shower is great for rinsing off when you return from the beach, which is only a 5 minute walk away. This palapa is an end unit, adjacent to a flourishing garden space. There is wifi in the palapa as well as in the common area by the pool and restaurant. The palapa has brand new air conditioning. While you may be spending most of your time at the beach, the available amenities at the Villas de Cerritos include: a pool and hot tub, restaurant (open during winter months) with fantastic wood-oven pizza, friendly front desk staff and 24 hour security. Additionally, there are many local activities, including surfing, snorkelling, fishing, whale watching, horseback riding, yoga, massages, shopping, dining and several other beaches you may want to explore. A vehicle is a must for getting around the area. The quaint town of Todos Santos is a 15 minute drive away, full of art galleries, shopping and great dining experiences. The town of Pescadero is only minutes away, Cabo is 45 minutes and the airport in San Jose is 1 hour, 15 minutes on the new bypass. We had a great stay at Heather's palapa. The space was clean and a perfect size for our family of 3 :) Its a large studio and has all the great amenities including the outside kitchen I LOVE! We loved the proximity to the pool too, so great! The only thing that we didn't love about the place was how close it was to the neighbors - the walls between the units are thinner than i would expect and we could hear everything going on next door. Any conversations outside in the kitchen patio area were also open for input by all neighbors LOL! It was fine and everyone was nice just a little too close and didn't feel as private as we would have liked. The complex is one of our favorites in Cerritos and we will keep coming back!!! Thank you Heather for sharing your place with us!! We loved our time at the palapa! My family and I had a fantastic time at the palapa. The proximity to the beach is great and the community in/at Cerritos Beach is very welcoming. I will definitely be back!! Perfect for all our needs! Such a great spot, excellent location, everything we needed! Lucky enough to have friends staying right across from us, so we had the best time ever. Would definitely book again! Heather was very helpful and quick to respond to any questions. Thanks Heather!!! The place was charming and perfectly suited for us! The property was clean, safe and had everything we needed. The pool was a bonus and we loved the outdoor kitchen! We can’t wait for our next visit. Basic accommodations were as described. Bed was comfortable and bathroom clean with good shower. Was not able to use the outdoor kitchen or leave the front door open because the flies were horrible! No other windows in the room that were reachable. Thank goodness the A/C worked well. Lovely pool on site and restaurant with food that was adequate since the nearest restaurants are a 10 minutes drive. It was a nice getaway from the heat in La Paz and we had a good time. This was the perfect place for our little family to stay. Cute, clean, and affordable palapa with a fun pool and hot tub. We loved the outdoor kitchen for dinner after a long day of exploring and playing at the beach. Definitely would like to come again soon! Thank you Heather! Thank you so much for coming to stay at Palapa 9. It was a pleasure to have you as guests and I am so pleased you enjoyed your vacation. Love to have you come stay again!